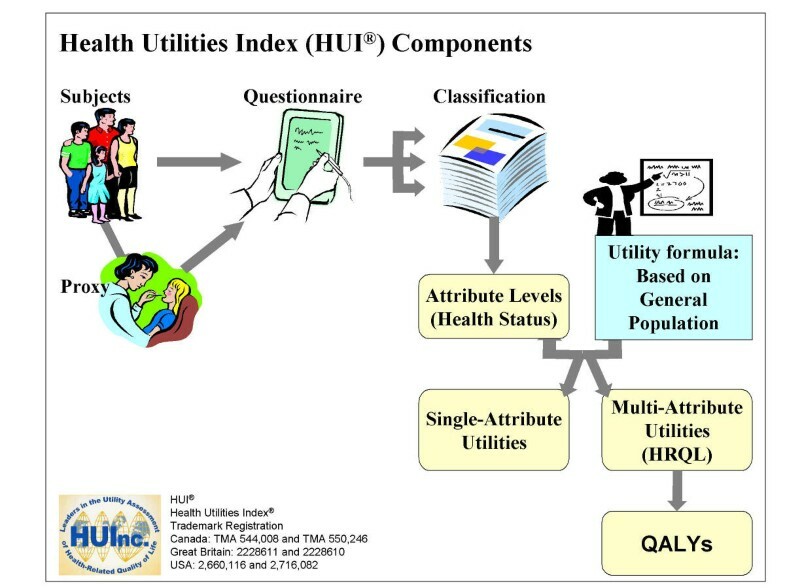 This is a review of the Health Utilities Index (HUI®) multi-attribute health-status classification systems, and single- and multi-attribute utility scoring systems. HUI refers to both HUI Mark 2 (HUI2) and HUI Mark 3 (HUI3) instruments. The classification systems provide compact but comprehensive frameworks within which to describe health status. The multi-attribute utility functions provide all the information required to calculate single-summary scores of health-related quality of life (HRQL) for each health state defined by the classification systems. The use of HUI in clinical studies for a wide variety of conditions in a large number of countries is illustrated. HUI provides comprehensive, reliable, responsive and valid measures of health status and HRQL for subjects in clinical studies. Utility scores of overall HRQL for patients are also used in cost-utility and cost-effectiveness analyses. Population norm data are available from numerous large general population surveys. The widespread use of HUI facilitates the interpretation of results and permits comparisons of disease and treatment outcomes, and comparisons of long-term sequelae at the local, national and international levels. FAQ 1: What is the Health Utilities Index (HUI)? HUI is a family of generic health profiles and preference-based systems for the purposes of measuring health status, reporting health-related quality of life, and producing utility scores. Health-related quality of life (HRQL), as defined by Patrick and Erickson, "is the value assigned to duration of life as modified by the impairments, functional states, perceptions, and social opportunities that are influenced by disease, injury, treatment, or policy" . HUI questionnaires, designed to elicit responses from a wide variety of subjects, make it easy to incorporate such a patient-reported outcome (PRO) and utility instrument into a clinical study. HUI evolved in response to the need for a standardized system to measure health status and HRQL to describe: 1) the experience of patients undergoing therapy; 2) long-term outcomes associated with disease or therapy; 3) the efficacy, effectiveness and efficiency of healthcare interventions; and 4) the health status of general populations. HUI currently consists of two systems, HUI2 and HUI3, which together describe almost 1,000,000 unique health states. Each of HUI2 and HUI3 includes a generic comprehensive health status classification (i.e., profile) system and a generic HRQL utility scoring system [2–4]. For most applications, HUI3 should be specified as the measure for primary analyses. It has the more detailed descriptive system of the two systems, full structural independence, and population norms available. HUI2 does offer distinct, independent attributes including self-care (for use with nursing home populations for example), emotion that focuses on worry/anxiety, and fertility. The two systems are independent but complementary, adding valuable information at low cost and with the HUI2 providing an efficient source of data for secondary/sensitivity analyses. The HRQL scoring systems provide utility (preference) scores on a generic scale where dead = 0.00 and perfect health = 1.00. HUI scores meet or exceed the criteria for calculating quality-adjusted life years (QALY), and the requirements of published guidelines for economic evaluations of pharmaceutical and other health care services [5, 6]. The health status classification and HRQL scoring systems are generic in terms of applying to all people age 5 years and older in both clinical and general populations. A health-status classification system based on HUI2 and HUI3 suitable for children 3 to 5 years of age is under development. HUI has been used in hundreds of clinical studies covering a wide variety of health problems and in numerous large general population surveys since 1990. There is a growing trend for the use of HUI as a primary health outcome measure in the form of QALYs. HUI measures have strong theoretical foundations, are valid, are reliable, and are well accepted by patients and professionals. HUI is a registered trademark of Health Utilities Inc., 88 Sydenham Street, Dundas, ON, L9H 2V3, Canada. FAQ 2: How was HUI developed? HUI is the product of more than 30 years of research at McMaster University and subsequent development by Health Utilities Inc. HUI was designed to provide large numbers of detailed descriptions of comprehensive health states and to provide a HRQL summary score for each unique description. The evolution of HUI has been guided by theoretical and empirical evidence . The classification systems were designed to link directly with preference-based scoring models based on multi-attribute utility theory. Each HUI2 and HUI3 classification system consists of attributes (domains) of health and 3 to 6 levels of functional ability/disability within each attribute. See FAQ 9 for details. There are two main approaches to measuring utilities, direct measurement and the use of multi-attribute systems. 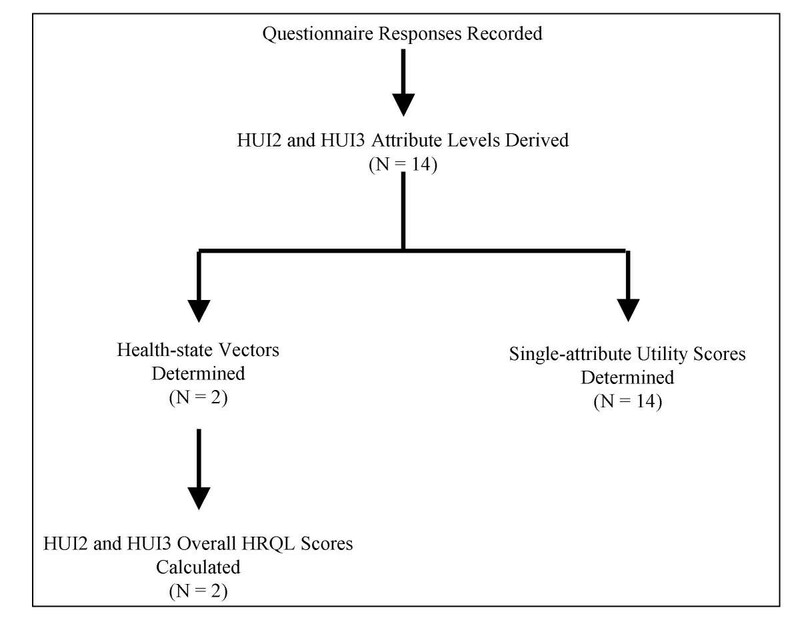 In the multi-attribute approach used for HUI, a respondent completes a questionnaire providing information about an individual's health status that is then scored using a multi-attribute scoring function derived from community preference measures for health states. See FAQ 11 for details. The first version of HUI, HUI1, was developed to evaluate outcomes for very-low birth-weight infants [7, 8]. From this early work a core set of the most important attributes was determined for HUI2 to address, specifically, the global morbidity burden of childhood cancer reflecting both the form and severity of cancer sequelae . HUI2 has been applied for more than 15 years to various groups of patients having a wide range of predicted global morbidity burdens, from survivors of cancer in childhood to the effects of Alzheimer's Disease on both patients and caregivers [10–14]. HUI3 was developed to address some concerns about the definitions of HUI2, to be applicable in both clinical and general population studies, and to have structural independence among the attributes. Attributes are structurally independent of each other if all combinations of levels in the system are possible. This makes the descriptive classification system efficient because each attribute contributes unique information. HUI is currently defined as including both HUI2 and HUI3 systems. Therefore, current HUI questionnaires cover both systems. The major criterion for selecting attributes for the HUI systems was the importance that members of the general public placed on each attribute . Attribute levels were defined to cover the full range of possible abilities/disabilities and to be clearly distinguishable from one another. HUI utility scores represent mean community preferences. The HRQL score for each health state is calculated using a mathematical formula (utility function) developed from preference scores measured in accordance with von Neumann-Morganstern utility theory . Subjects were asked to rate states on a 100-point visual analogue scale (VAS), then to assess a series of health states using a standard gamble chance board (SG). This combination of preference measures ensures appropriate ranking of scores among health states and provides a direct link to the fundamental axioms of utility theory [3, 16]. HUI uses multiplicative, multi-attribute utility functions. The multiplicative form captures the important preference interactions among health states and has been shown to accurately predict mean scores from an independent sample , one of the main purposes of the HUI. FAQ 3: Why use HUI? HUI is applicable to most people. It provides descriptive health profile measures and HRQL scores on a generic scale. HUI also provides single-attribute scores of morbidity for each attribute. Users are encouraged to report single-attribute scores when applicable to provide insight into specific health attribute deficits and to highlight avenues of additional study. Each HUI attribute (dimension) has 3–6 levels of discrimination and is very responsive to changes in health caused by treatment therapies or other influences. Budget holders are increasingly insisting on an economic evaluation to establish that new treatments provide value for money. Many developed countries, including Australia , Canada , The Netherlands , the UK , and the USA , have now created guidelines for such studies. HUI measures of HRQL meet or exceed the criteria for utility scores used to calculate QALYs for cost-utility economic evaluations. HUI is available in many languages and versions to accommodate its use in studies of varying objectives and methodologies. Standard HUI questionnaires are available in both self-complete and interviewer-administered formats, in both self-report and proxy-report versions. There are four standard assessment recall duration periods (see FAQ 12 for details). FAQ 4: How can I apply HUI? HUI is most frequently used in prospective studies as a means to describe health status and to obtain utility scores. Utility scores are used to estimate HRQL and QALYs. They are used in cost-utility analyses and related studies of cost effectiveness , for the timely formulation of clinical policy , as patient reported outcomes (PROs) [22, 23], as well as in general population health studies . HUI data is collected using one or more questionnaires in formats selected to match the specific study design criteria. These criteria include the mode of questionnaire administration, assessment viewpoint, language, and health-status recall timeframe or assessment period. FAQ 5: Is HUI reliable and valid? Readers are invited to visit the HUI web page at http://www.healthutilities.com and review the annotated references of articles from hundreds of studies worldwide for evidence of HUI validity (face validity, content validity, construct validity, convergent validity, discriminative validity, predictive validity), reliability and responsiveness. For example, HUI health-status classification systems and preference scoring systems have been validated in many ways by investigators around the world [25–29]. Direct evidence of the international generalizability of HUI utility scoring functions comes from Le Galès et al  who report a French-based HUI3 multi-attribute function very similar to the original function from Canada. FAQ 6: Is HUI responsive to change in health status? HUI measures have been shown to be responsive to changes in health status over time [2, 31, 32]. Responsiveness and sensitivity to change are important properties of a measure in detecting effects of treatment or other changes over time. FAQ 7: What is a meaningful change in HUI scores? Drummond  reported that differences of 0.03 or greater in mean HUI overall HRQL scores were definitely important, and differences as little as 0.01 may be meaningful and important in some contexts. This is generally supported by Grootendorst et al , who reported that a difference in mean overall scores of 0.03 or more should be considered as clinically important, and by Samsa et al , who indicate minimal clinically important differences of 0.02 to 0.04 in overall HUI scores with 95% confidence bounds of 0.01 to 0.05. Samsa et al based their estimates on results from 160 patients chosen at random from the ambulatory care clinic of a Veterans Administration hospital, to amass a group of patients who "tended to be relatively disabled or in otherwise poor health". Descriptive levels within HUI attributes were defined to be meaningfully different from each other and the smallest difference in utility scores between levels of an HUI attribute is 0.05. Therefore, a difference of 0.05 is meaningful and perhaps smaller differences are as well. FAQ 8: What are the components of HUI? There are four key components of each HUI system: a health-status classification system, a preference-based scoring function, data collection questionnaires, and coding algorithms for deriving HUI variables from responses to the questionnaires. 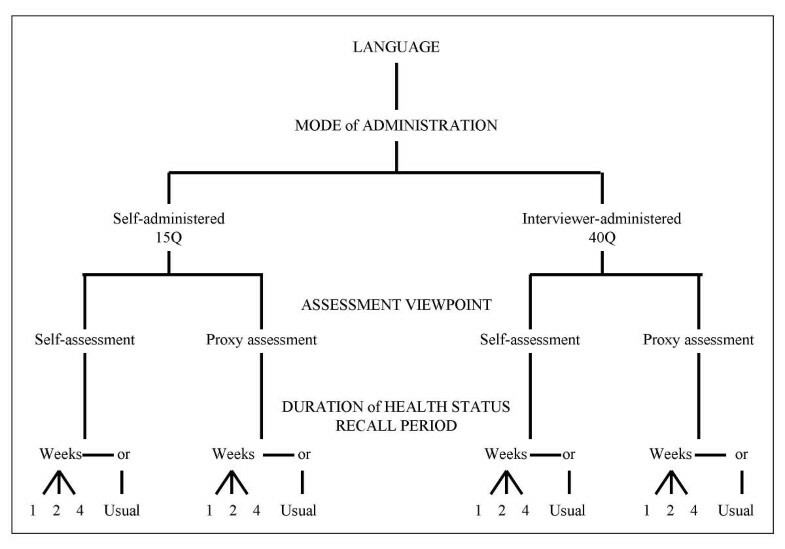 Figure 1 illustrates the HUI components showing the flow of information about a study subject collected via a questionnaire, through the derivation of health status attribute levels and utility scores, to estimate quality adjusted life years (QALYs). Components of the Health Utilities Index. (See FAQ 8). The classification systems were designed to link directly with preference-based, multi-attribute utility functions. HUI2 and HUI3 are complementary systems, and provide for each subject a descriptive measure of ability or disability on each HUI2 and HUI3 attribute as well as a composite description of overall health status according to both systems. Preference-based scoring functions convert descriptive measures of disability into measures of morbidity for levels within each attribute and measures of overall HRQL for comprehensive health states described by a set of attribute levels. This two-part approach is consistent with commonly held definitions of the concept of HRQL. HUI questionnaires are designed to ask the minimum number of questions in order to classify the health status of a subject according to both the HUI2 and HUI3 systems. A variety of questionnaire formats have been developed to suit the needs of most surveys. Questionnaire versions are defined by language, mode of administration, assessment viewpoint and health-status recall duration. For more detail on questionnaire characteristics, see FAQ 12: How many HUI questionnaires are there? Coding algorithms are detailed in the HUI Procedures Manuals. The algorithms specify how to derive levels for each HUI2 and HUI3 attribute from questionnaire responses. The derived levels are then combined with utility functions to calculate single-attribute utility scores and an HRQL score for both the HUI2 and HUI3 systems. FAQ 9: What are the HUI Classification Systems? HUI2 and HUI3 health status classification systems are complementary. Together they provide descriptive measures of ability or disability for health-state attributes, and descriptions of comprehensive health status. For a complete description of the HUI Mark 2 and HUI Mark 3 classification systems see Tables 1 and 2 respectively. The HUI2 classification system includes 7 attributes – Sensation, Mobility, Emotion, Cognition, Self-Care, Pain and Fertility – each with 3 to 5 levels. It describes 24,000 unique health states. The HUI2 level descriptions in Table 1 are worded exactly as they were presented to interview subjects in the HUI2 preference survey. Attributes Sensation, Mobility, Emotion, Cognition, Self-Care and Pain form the core of the HUI2 system. Fertility was included because the original application was concerned about sub-fertility and infertility sequelae associated with childhood cancer and its treatment. Fertility is not assessed using current HUI questionnaires. Able to see, hear, and speak normally for age. Requires equipment to see or hear or speak. Sees, hears, or speaks with limitations even with equipment. Able to walk, bend, lift, jump, and run normally for age. Walks, bends, lifts, jumps, or runs with some limitations but does not require help. Requires the help of another person to walk or get around and requires mechanical equipment as well. Unable to control or use arms and legs. Generally happy and free from worry. Almost always fretful, angry, irritable, anxious, depressed. Extremely fretful, angry, irritable, anxious, or depressed usually requiring hospitalization or psychiatric institutional care. Learns and remembers school work normally for age. Learns and remembers school work more slowly than classmates as judged by parents and/or teachers. Learns and remembers very slowly and usually requires special educational assistance. Unable to learn and remember. Eats, bathes, dresses, and uses the toilet normally for age. Eats, bathes, dresses, or uses the toilet independently with difficulty. Requires mechanical equipment to eat, bathe, dress, or use the toilet independently. Requires the help of another person to eat, bathe, dress, or use the toilet. Free of pain and discomfort. Occasional pain. Discomfort relieved by non-prescription drugs or self-control activity without disruption of normal activities. Frequent pain. Discomfort relieved by oral medicines with occasional disruption of normal activities. Frequent pain; frequent disruption of normal activities. Discomfort requires prescription narcotics for relief. Severe pain. Pain not relieved by drugs and constantly disrupts normal activities. Able to have children with a fertile spouse. Difficulty in having children with a fertile spouse. Unable to have children with a fertile spouse. Able to see well enough to read ordinary newsprint and recognize a friend on the other side of the street, without glasses or contact lenses. Able to see well enough to read ordinary newsprint and recognize a friend on the other side of the street, but with glasses. Able to read ordinary newsprint with or without glasses but unable to recognize a friend on the other side of the street, even with glasses. Able to recognize a friend on the other side of the street with or without glasses but unable to read ordinary newsprint, even with glasses. Unable to read ordinary newsprint and unable to recognize a friend on the other side of the street, even with glasses. Unable to see at all. Able to hear what is said in a group conversation with at least three other people, without a hearing aid. Able to hear what is said in a conversation with one other person in a quiet room without a hearing aid, but requires a hearing aid to hear what is said in a group conversation with at least three other people. Able to hear what is said in a conversation with one other person in a quiet room with a hearing aid, and able to hear what is said in a group conversation with at least three other people, with a hearing aid. Able to hear what is said in a conversation with one other person in a quiet room, without a hearing aid, but unable to hear what is said in a group conversation with at least three other people even with a hearing aid. Able to hear what is said in a conversation with one other person in a quiet room with a hearing aid, but unable to hear what is said in a group conversation with at least three other people even with a hearing aid. Unable to hear at all. Able to be understood completely when speaking with strangers or friends. Able to be understood partially when speaking with strangers but able to be understood completely when speaking with people who know me well. Able to be understood partially when speaking with strangers or people who know me well. Unable to be understood when speaking with strangers but able to be understood partially by people who know me well. Unable to be understood when speaking to other people (or unable to speak at all). Able to walk around the neighbourhood without difficulty, and without walking equipment. Able to walk around the neighbourhood with difficulty; but does not require walking equipment or the help of another person. Able to walk around the neighbourhood with walking equipment, but without the help of another person. Able to walk only short distances with walking equipment, and requires a wheelchair to get around the neighbourhood. Unable to walk alone, even with walking equipment. Able to walk short distances with the help of another person, and requires a wheelchair to get around the neighbourhood. Full use of two hands and ten fingers. Limitations in the use of hands or fingers, but does not require special tools or help of another person. Limitations in the use of hands or fingers, is independent with use of special tools (does not require the help of another person). Limitations in the use of hands or fingers, requires the help of another person for some tasks (not independent even with use of special tools). Limitations in use of hands or fingers, requires the help of another person for most tasks (not independent even with use of special tools). Limitations in use of hands or fingers, requires the help of another person for all tasks (not independent even with use of special tools). Happy and interested in life. So unhappy that life is not worthwhile. Able to remember most things, think clearly and solve day to day problems. Able to remember most things, but have a little difficulty when trying to think and solve day to day problems. Somewhat forgetful, but able to think clearly and solve day to day problems. Somewhat forgetful, and have a little difficulty when trying to think or solve day to day problems. Very forgetful, and have great difficulty when trying to think or solve day to day problems. Unable to remember anything at all, and unable to think or solve day to day problems. Mild to moderate pain that prevents no activities. Moderate pain that prevents a few activities. Moderate to severe pain that prevents some activities. Severe pain that prevents most activities. The HUI3 classification system is comprised of 8 attributes – Vision, Hearing, Speech, Ambulation, Dexterity, Emotion, Cognition and Pain – each with 5 or 6 levels of ability/disability. It defines 972,000 unique health states. HUI3 level descriptions in Table 2 are worded exactly as they were presented to interview subjects in the HUI3 preference survey. The reader will note that across the two systems, attributes of the same name have different underlying constructs. HUI2 Emotion is concerned with distress and anxiety while HUI3 Emotion focuses on happiness versus depression. Similarly, HUI2 Cognition concentrates on learning whereas HUI3 focuses on ability to solve day-to-day problems. HUI3 Pain considers severity of pain while HUI2 Pain includes frequency of pain and type of control. Despite the overlap in the two systems, each has its advantages and disadvantages. (See FAQ 1 for details about some major differences/similarities of the HUI2 and HUI3.) Many studies derive both HUI2 and HUI3 measures to take full advantage of the richness of HUI. FAQ 10: How are HUI derived variables determined from questionnaire responses? Current HUI questionnaires were designed to collect sufficient information to determine the full set of 32 HUI2 and HUI3 derived variables. The 32 variables include attribute levels (n = 14), single-attribute utility scores (n = 14), overall health-state vectors (n = 2), and overall HRQL utility scores (n = 2). Detailed sets of algorithms are presented in HUI questionnaire coding and procedures manuals to derive attribute levels and single-attribute utility scores via look-up tables, and to calculate multi-attribute utility scores of HRQL for each subject. Figure 2 outlines the schema for deriving the full complement of HUI levels, health state vectors and utility scores. Schema for derivation of HUI variables and utility scores. (See FAQ 10). FAQ 11: How is HUI scored? HUI is scored using single- and multi-attribute utility functions. Utilities are preference scores measured under conditions of uncertainty and utility functions convert descriptive information into utility scores. Utility scores have interval-scale measurement properties [2, 35]. Interval-scale measurement properties are important to support the use of HUI in constructing single summary indexes and to enable the use of parametric statistical techniques for making comparisons among clinical groups. Utility functions include look-up tables and mathematical formulae. Single-attribute utility functions convert descriptive information about levels within attributes into preference measures of within-attribute morbidity. Single-attribute scores of morbidity are defined on a scale such the worst level has a score of 0.00 and the best level has a score of 1.00. Multi-attribute utility functions convert comprehensive health state descriptions (i.e., vectors of one level for each attribute defined by a HUI classification system) into preference measures of overall HRQL. The multi-attribute scales of overall HRQL are defined such that the score for dead = 0.00 and the score for perfect health = 1.00. Both HUI2 and HUI3 allow for negative scores of HRQL that represent health states considered worse than dead. The lowest possible HRQL scores are -0.03 for HUI2 and -0.36 for HUI3. FAQ 12: How many HUI® questionnaires are there? There are 16 versions of HUI questionnaires in the English language and many of these versions are available in other languages. Versions of HUI questionnaires are defined by combinations of the 4 factors listed and described in detail below: mode of administration; assessment viewpoint; duration of health status assessment period; and language of questionnaire. Each HUI questionnaire is designed to ask the minimum number of questions required to classify a subject's health status according to both HUI2 and HUI3 classification systems. The 15-item questionnaire (15Q) is designed for self-completion, includes 15 multiple-choice HUI questions, and takes approximately 5–10 minutes to complete . The 40-item questionnaire (40Q), with a built-in skip-pattern based on item response, is designed for interviewer administration either face-to-face or by telephone. Interviewer-administered questionnaires are typically completed in approximately 3 minutes . Each of the 15Q and 40Q formats of HUI questionnaires are available in two versions: a self-assessment version, to collect information from people about their own health; and a proxy-assessment version, to collect information about the health status of study subjects from people other than the subjects themselves. Proxy versions are useful when study subjects are unable by virtue of age (too young), mental incapacity (e.g., senile), or health status (unconscious), to answer for themselves. Proxy respondents, such as a parent or spouse or healthcare professional or other responsible individual, may be asked to provide answers in lieu of the subject or in addition to the subject. Assessment periods are described as current or usual. Current versions specify defined recall time durations. HUI has 3 standard current assessment periods: past 1-week, past 2-weeks, and past 4-weeks. A current health focus should be used in clinical studies and economic evaluations in which the concern is to monitor change in health. Usual versions do not specify defined recall time periods. The usual health focus is often used in population health surveys, where short-term illnesses like colds are not the major concern. Standard HUI questionnaires are available in English, Chinese (Simplified, Traditional), Dutch, French (European, Canadian), German, Italian, Japanese, Portuguese (European, Brazilian), Russian, Spanish (European, Latin American, USA), and Swedish. There are 16 versions of HUI questionnaires in the original English language version based on mode of administration, assessment viewpoint and duration of the health status assessment period. Not all 16 versions are available in other languages. Readers should contact the HUI Service Centre (see FAQ 18) for information about the availability of specific versions. Other language versions in development include Czech, Polish, Finnish, Norwegian and Danish. 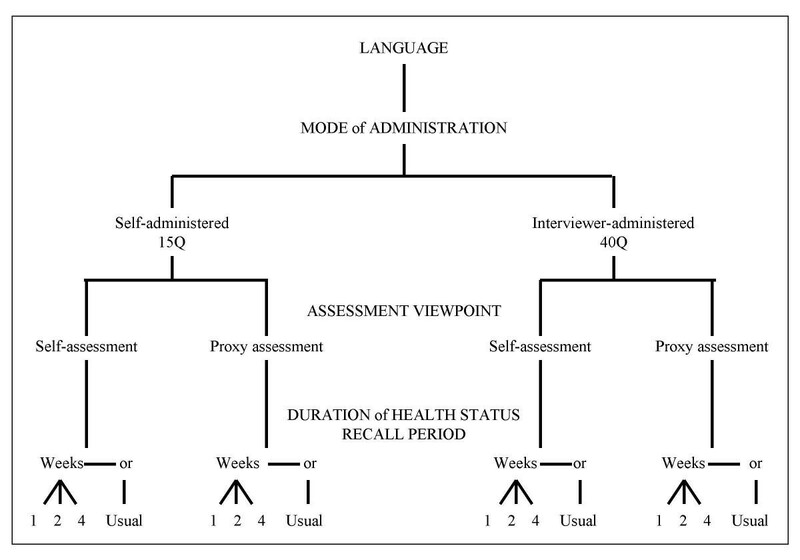 The schematic in Figure 3 illustrates key features for the 16 standard HUI questionnaire versions defined by 3 factors: mode of administration (n = 2), assessment viewpoint (n = 2), and duration of health status recall period (n = 4). Schema of factors that determine HUI questionnaire version. (See FAQ 12). FAQ 13: Who answers HUI questionnaires? Study design should define the assessment viewpoint (self or proxy), and thus who answers HUI questionnaires. Typical proxy respondents include parents of children too young to answer for themselves, spouses or children answering for elderly patients, and health-care professionals attending to study patients. Table 3 outlines the questionnaire formats recommended for subjects in various age range categories. Legend: 1 = Gold standard for specified age range 2 = Best alternative for specified age range NR = Not recommended Note: Age limits are approximate. Investigators should consider the characteristics of their study population and consult with HUI staff to determine the most appropriate questionnaire(s) for use in a specific study. FAQ 14: In which populations has HUI been used? HUI has been used in both clinical and general population surveys. It has been used throughout North, Central and South America (USA, Canada, Argentina, Brazil, Colombia, Cuba, El Salvador, Honduras, Nicaragua, Puerto Rico, Uruguay), in Europe (France, Germany, Italy, Netherlands, Portugal, Spain, Sweden, United Kingdom), and in many other parts of the world including Australia, Hong Kong, Israel, Japan, Singapore, and Turkey. Clinical applications include paediatric and adult oncology, haemophilia, vonWillebrand's disease, arthritis, stroke, osteoporosis, diabetes, renal dialysis, multiple sclerosis, AIDS, hepatitis, Alzheimer's disease, asthma, bone marrow transplant, orthopaedic surgery (hip and knee replacement), cardio-vascular diseases, chronic liver disease, epilepsy, neonatal intensive care, lupus, migraines, rhinitis, and cochlear implants in children and adults. HUI has been used in major general population surveys in a number of countries, including the USA Health and Retirement Survey 2000 and in Singapore . It has been used in every major population health survey in Canada since 1990, including the National Population Health Surveys conducted by Statistics Canada every two years since 1994 and the Canadian Community Health Survey (begun in 2000). To date more than 300,000 subjects have been surveyed with HUI. For published information about HUI use with a specific disease, country, or language, see the annotated reference section of the following web site: http://www.healthutilities.com. FAQ 15: Has the HUI been used for individual patient assessment? There is increasing interest in using HUI as a routine individual patient assessment tool. There are currently a few clinics, notably a neurosurgery clinic, in which routine HUI assessments are administered to every new patient and at intervals for continuing patients . The clinic uses an in-house computer system to administer HUI questionnaires and report, via graphs and charts, the patient's current health-status measurements. Health Utilities Inc. is expanding this type of application by developing an Internet web-based system to present questionnaires and determine HUI variables in real time for use in health-care settings (see Summary). FAQ 16: Is there an automated system for collecting HUI questionnaire data and for determining HUI derived variables? There is a lot of variability in the way users collect and analyze HUI data. At present, HUI instruments are supplied in a paper and pencil completion format. Paper copies of the questionnaire and procedures manual are sent by courier for overnight delivery, usually within 1 working day of receiving a confirmed order. Electronic copies of the questionnaire, in MSWord format, may also be obtained by email to facilitate word processing of study-specific questionnaire response booklets. Analysts use a wide variety of software packages, and versions of software packages, to manage and analyze data. Furthermore, database details are study-specific. Therefore, detailed algorithms and look-up coding tables (decision tables) have been developed for determining HUI derived variables. These tables can be translated, relatively easily, into program syntax of all statistical software packages (e.g., SPSS, SAS, S-PLUS). The algorithms and decision tables are contained in HUI coding and procedures manual supplied by Health Utilities Inc.
An Internet web-based system for questionnaire administration and data management is under development and projected to be ready for routine use in early 2004 (see Summary for more details). FAQ 17: Is there an item bank of HUI results? Since 1990, HUI3 has been used in every major Canadian population health survey. To date over 300,000 individuals have been interviewed in these surveys and banked as part of Statistics Canada's mandate to collect, store and make available data for researchers to utilize. Statistics Canada affords access to public-use files and limited access to its master data files, including HUI3 data, through Research Data Centres located at strategic academic institutions across Canada. Statistics Canada provides some data access without charge but in some cases charges may apply. Readers should consult the Statistics Canada web site for details http://www.statcan.ca. FAQ 18: How do I obtain more information about the Health Utilities Index? For general background we recommend you read Furlong, Feeny, Torrance and Barr, The Health Utilities Index (HUI®) system for assessing health-related quality of life in clinical studies. Annals of Medicine 2001; 33: 375–384. You may also contact HUI staff for assistance through internet or email connections, facsimile machine, telephone including voice mail, or regular post at the following addresses/numbers. John Horsman at horsmanj@mcmaster.ca, or huinfo@healthutilities.com. FAQ 19: How do I obtain scientific support for HUI during a study? Support in the form of initial consultation in selecting the most appropriate instruments for a specific use is available by submitting an Application Profile through the HUI Service Centre web site, http://www.healthutilities.com. Advice and ongoing HUI/study-specific support is available by contacting HUI staff as described in FAQ 18. FAQ 20: How do I obtain permission to use HUI instrumentation? Health Utilities Inc. licenses its proprietary instruments (e.g., questionnaires and procedures manuals) for use one study at a time. Copies of HUI instruments should not to be distributed or used without written permission from Health Utilities Inc. People considering using HUI are invited to complete, without obligation, an on-line "Application Form" at http://www.healthutilities.com or to contact HUI staff as described in FAQ 18. FAQ 21: Whom do I contact to obtain a copy of HUI? HUI staff, experienced in health and health-economics research methodology and practice, are available to assist in the selection of the appropriate HUI instrument for your application. HUI staff may be contacted by email, phone, fax, regular mail, or internet as described in FAQ 18. FAQ 22: How much does it cost for a license to use HUI instrumentation? Health Utilities Inc. has proprietary copyright and trademark to the "HUI" and "HUI – Health Utilities Index and design" for instrumentation, including questionnaires and manuals. Instruments are licensed for use in one study/project at a time. It is recommended that users obtain an estimate of the HUI licensing fees for a specific study from Health Utilities Inc. by submitting an on-line application through http://www.healthutilities.com. In general, the minimum licensing fee is $USA 3,000.00 for use of one version of HUI questionnaire and appropriate coding procedures manual in one study. If the study requires more than one questionnaire the fee schedule becomes more complicated. For example, a study using two self-complete questionnaires (e.g., self-complete and self-assessed in both English and Spanish) should budget $USA 4,500.00 (the manual is in common) while a study using a self-complete and an interviewer-administered questionnaire should budget $USA 6,000.00 (fee reflects payment for one additional questionnaire and one additional manual). The manual provides detailed instructions for coding and scoring responses about each subject. Health Utilities Inc. offers a limited number of grants each year to support the use of HUI instrumentation by graduate students and junior faculty in non-funded studies. Grants consist of the use of one standard HUI instrumentation package at no cost to the recipient, subject to certain conditions. Contact the HUI Service Centre for details. HUI is a generic, preference-based, comprehensive system for measuring health status and health-related quality of life and for producing utility scores. HUI is reliable, valid, responsive and easy to use and administer. HUI questionnaires are available in many languages, in self- and proxy-assessment versions, in self- and interviewer-administered formats, and with various recall assessment periods. The self-administered format can be completed in approximately 8 minutes and the interviewer-administered version in about 3 minutes. HUI support services are readily available from HUI Service Centre. A number of large general population surveys have provided important reference data for interpreting HUI results from clinical studies. HUI is applicable to all persons 5 years of age and older. A health-status classification system, based on HUI2 and HUI3, suitable for children 3 to 5 years of age is under development. Future plans for HUI include the development of a web-based system for questionnaire administration, automatic derivation of single-attribute levels and utility scores, and with results returned in real-time to the client/researcher. The HUI internet system is expected to be available early in 2004. David Feeny, PhD. Developer of HUI, founder and President of Health Utilities Inc. Fellow of the Institute for Health Economics and Professor at the University of Alberta. William Furlong, MSc. Developer of HUI, and founder of Health Utilities Inc. Coordinator of HUI Service Centre and Research Associate at McMaster University. John Horsman, BA. HUI Service Centre Coordinator. Researcher with more than 20 years experience in health and health economics at McMaster University. George Torrance, PhD. "Grandfather" of the utility approach to assessing health status and health related quality of life. Developer of HUI, and founder of Health Utilities Inc. Professor Emeritus and former Dean of the Faculty of Business, McMaster University. The authors gratefully acknowledge the help of Sonja DePauw, Morag Horsman and Danielle Talsma in reviewing earlier drafts of this manuscript and their invaluable suggestions in making it better. The authors also acknowledge the useful comments and suggestions made by Dr. Ronald D. Hays and the Editor.